Prince Louis' Latest Pic With Mom Kate Middleton Has Internet Going "Aww"
"The Duke and Duchess hope that everyone enjoys this lovely photograph of Prince Louis as much as they do." A beaming Kate Middleton with Prince Louis. The littlest member of the British royal family, Prince Louis, has the Internet going mushy with his latest adorable picture. Taken at his christening last week, the photograph follows a set of family portraits released by the royal family earlier. 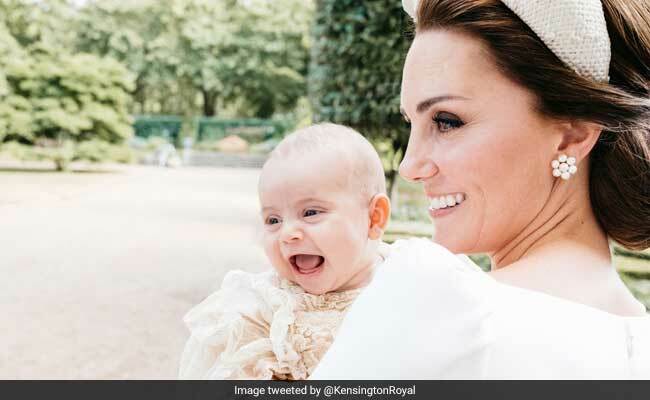 The candid photograph shows a glowing Kate Middleton cradling her youngest son - a grinning Prince Louis. It was released just half an hour ago, and has already garnered almost 6,000 'likes' on Twitter and 1.3 lakh 'likes' on Instagram. "The Duke and Duchess hope that everyone enjoys this lovely photograph of Prince Louis as much as they do," says the accompanying caption. sooooo cute !!!!! Probably smiling at his big brother and big sister!!! ADORABLE!!!! Beautiful photo, both mum & baby boy beaming. Members of the royal family, including the newlywed Prince Harry and Meghan Markle, along with Prince George and Princess Charlotte, gathered at Clarence House for a private afternoon ceremony last Monday. The Queen and Prince Philip were notably absent, having made the decision not to attend the christening, according to the UK's Press Association. Here are other pictures from after the ceremony. The Duke and Duchess of Cambridge with Members of the @RoyalFamily in the Morning Room at Clarence House, following Prince Louis's christening. The Duke and Duchess of Cambridge, Prince George, Princess Charlotte and Prince Louis, following Prince Louis's christening. The Duchess of Cambridge and Prince Louis in the garden at Clarence House, following Prince Louis's christening. According to the BBC, Prince Louis wore a long silk and lace robe. The garment is a handmade replica of the 1841 Royal Christening robe, worn by over 62 royal babies at their christenings - until the Queen commissioned a replica in 2008 to preserve the original.